Since understanding oil pan capacities & their relationship to “dip sticks” seems to be an ongoing topic of discussion, I will attempt to explain what it really means. What is most important to remember or understand is that oil pan (sump) capacity is exactly that, and HAS ZERO to do with oil filters, oil lines, oil coolers or ?? The second most important part of understanding oil capacity is to realize that the dipstick measures OIL PAN capacity and it has NOTHING to do with the oil filter being full or not, and/or any other oil in the system which is part of the “total system capacity”. “System Capacity” is that amount of oil in the pan (the dipstick measures that), and all of the other oil that is in the engine (oil filter, lines & hoses, oil galleries, etc.) that cannot be drained from the oil pan under normal circumstances. Cummins 330/370 Diamond with late style reversible screw-in locking dip stick. Cummins changed the marine oil pan design for this engine about 2002 (maybe the 4th time now since 1985 when they released the Marine version of the 5.9 B series) to include better internal baffling (helps to mitigates “oil windage”), and came up with a new designed reversible and locking dip stick – Nice improvement and is standard on all of the REMAN Marine B’s as well!!!! Understanding the basics in changing oil and having a correctly marked dipstick is very simple. 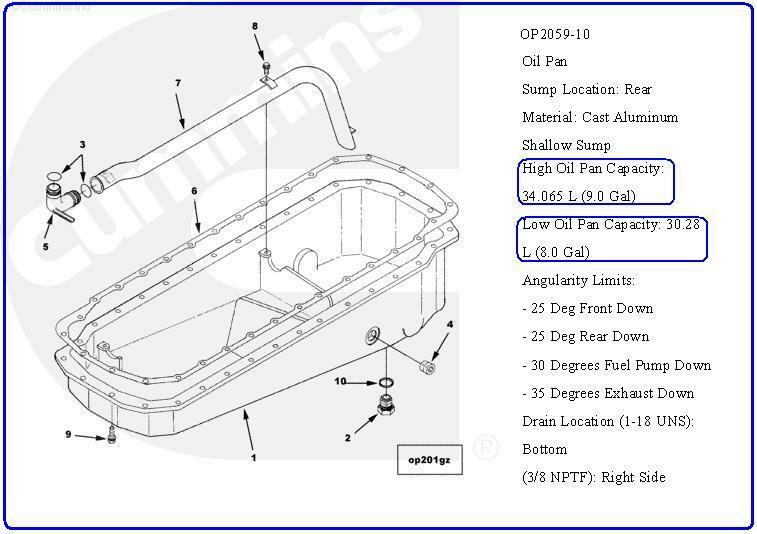 Drain the oil pan completely, add the correct amount of oil to the pan listed in the chart (LOW mark first). Wait a couple of minutes & check your dipstick a FEW TIMES to be sure it is correctly marked for the LOW MARK – If not, then remark it correctly. Then add the 1-4 quarts listed and check your HIGH MARK. If you change your oil filter, it’s always best to fill it first (no dry starts wanted) and you are done. If your filter was installed empty or dry, after you start it, the oil level will be slightly below the high mark as some oil in the pan was used to fill the filter. If you pre-filled the filter, then the oil level in the pan will be as it was (or very close to it) after the start-up and fill. Pictures of correctly, and incorrectly, marked dip sticks. I do not know what the “scallop” marks mean, as they came from the factory like this. The correct marks are the scratches on the bottom of the sticks. These are from a QSM that has seen more than its share of dip stick issues over the years. Somehow, I always thought the dip stick was a simple part of the overall engine design??? And last in my personal opinion, running your engine towards the lower mark on the dipstick has NO detrimental effects on the engine. 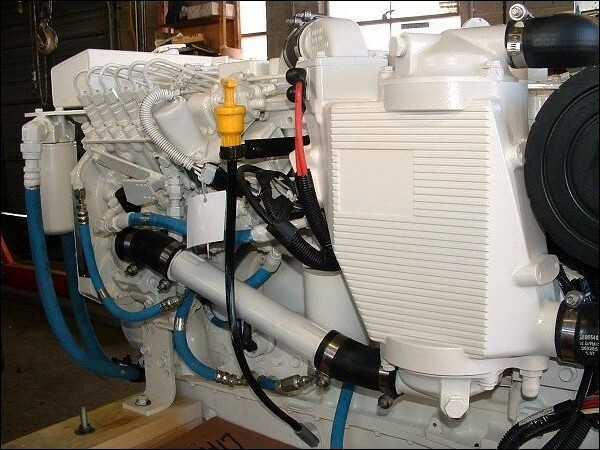 Field practice has shown that in the case of a B series Cummins that uses the shallow marine oil pan option, and rides up on plane with the BOW HIGH, that oil issues can be mitigated better by having the oil level in in the pan closer to the LOW mark. In general, and from a personal point of view, we prefer keeping the oil level in the oil pan in-between the “marks” on a correctly marked dip stick on all engines regardless of the color. This also applies to transmissions and/or gear boxes. 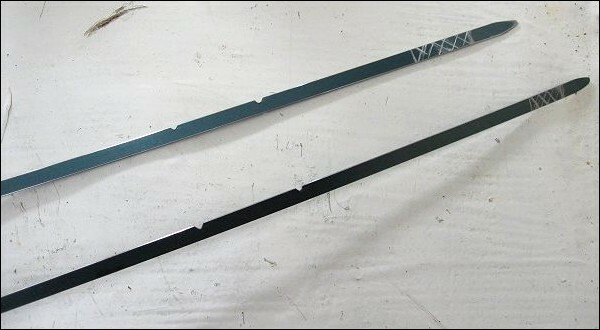 Dip Stick Option: on Exhaust side (usually port motor): Add 9 Gallons and mark HIGH) – 8 Gallons may or may not show at the bottom of the stick, so as long as you see any oil on the stick you have at least 8 gallons. So simple even a Fisherman can figure it out! !